When did Romania become known as the country by that name? COMMENTARY: When did Romania become known as the country by that name? Editorial Note: There is confusion regarding the origin of the name Romania given that it long appeared as Rumelia (or Romania or Romaio) in history books and on maps in reference to an area currently encompassed by Bulgaria. The name Byzantium for this same area was derived from the Greek “Basileia Romaion” [Empire of the Romaioi or Romans]. For a cogent explanation of the evolution of the name see. The “name” question is interesting if only because the factual answer is not widely known. I tried the same question once in England. When did the country first get officially named England? Few people knew, though many knew that in ancient times the main Isle was widely known as Albion and that until 1000 A.D. a long lineage of Welsh Kings preceded the current Royal lineage. How about Romania (or Rumania or Roumania as it has also been spelled)? The nation consists in present times of three primary regions or provinces: Transylvania (North and West), Moldavia (East), and Wallachia (south) which were briefly united in 1599-1600 by Mihai the Brave (Mihai Viteazul). Transylvania, in ancient times known as Dacia, fell in more recent centuries under the rule of the Austro-Hungarian Empire only to become united into modern Romania after WW One. The two other regions long known as Wallachia and Moldavia were commonly referred to in the 1500s to 1700s as “The Two Principalities‘. They were under the suzerainty of the Ottoman Turkish Empire until a first major defeat by the Russians in 1769 weakened that hold. Austria, too, started to exert more influence in the northern Bucovina region and south of the Carpathian Mountains in Wallachia. This opened the door to early expressions of nationalism among the populace. But by 1812, Russia relinquished control to the Turks. Twenty years later the tide would turn again and Russia would reestablish its influence by taking advantage of Turkish weaknesses. In what would later be viewed as an enlightened decision, Count Paul Kisselev was sent by the Tsar to rule the two Principalities. His rule, writes historian R. W. Seton-Watson, “is the transition from chaos and decay to the first rudiments of ordered and decent government.” His legacy survives today in the name of one of Bucharest’s most beautiful tree-lined boulevards. More importantly was his introduction of a “constitutional’ regime accepted in Wallachia in 1831 and a year later in Moldavia. By agreement with Turkey they would be ruled by local aristocratic families; the former by Prince Ghica and the latter to be ruled by Prince Sturdza. During this period peasants were granted greater rights though still abused by the land-owning class through taxation and endentured work. At the same time, this wealthy boyard class, influenced by studies in western Europe, started to talk of union between the two provinces. This movement led to the elimination of custom boundaries in early 1846 and the two provinces were relabeled “The United Principalities.” A period of revolutionary ferment ensued emanating from France, Italy and other countries and with it emerged a new young generation of western inspired leaders by the names of Bibescu, Bratianau, Rosetti, Eliade, and Golescu. But their thirst for radical change was soon tamed by the renewed influence of Russia and Turkey on the Principalities while Austria and France advanced their own schemes to exert influence. Paris became a refuge for the new young leaders and their hoped-for revolution. It was in Paris, in 1855, that a review was launched entitled “The Future Romania” (Romania Viitoare) and another called Republica Romana. The name “Romania was” used for the first time in reference to the united Principalities and the long-nurtured dream of reunification with Transylvania during the late 1500s. Ion Bratianau wrote of a free nation with “10 million Romanians.” France, then under the reign of Napoleon III, was viewed as the home and patron of modern ‘nationality’ and the Emperor was persuaded to acknowledge the cause of the “Romanian principalities.” Soon after Britain’s House of Commons voted to recognize and encourage the movement towards unity. In the Wallachian Diet “four points”, autonomy, union, a foreign prince [as ruler], and representative government, were cheered with shouts of “Long Live Romania.” However, this enthusiasm did not prevent the Great powers from officially reverting to the lengthened official name “United Principalities of Moldavia and Wallachia” and agreeing to let both remain under suzerainty of Turkey but with externally guaranteed rights. 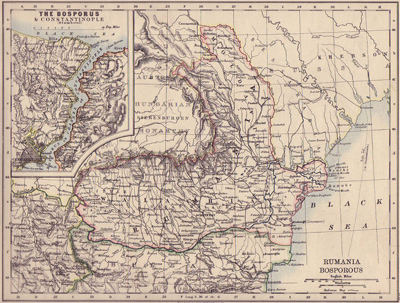 By late 1858, Moldavia elected Alexander Cuza, a nationalist, as king of the Province. Shortly after he was elected in Wallachia and thus became the symbol of unity between the two provinces. 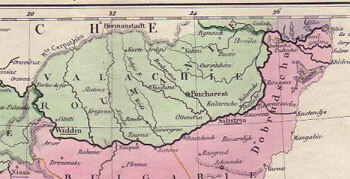 On January 24 of 1862, the name Romania was officially established with its capital city to be Bucharest in Wallachia. As Seton-Watson observed: “Roumania had safely come to birth, but not thanks to the midwifery of the presiding Great Powers.” Cuza would last eight turbulent years before being deposed. One of the instigators was Ion Bratianu who, like others, favored a foreign prince as ruler and unifier. Working in concert with Napoleon III, Bratianu identified a German von Hohenzollern-Sigmaringen, Prince Charles (Carol), as a suitable candidate – with the added benefit of being related by adoption through his grand-mother to Napoleon. In March of 1866 he was elected Prince and then in 1881 as King and by constitutional reform became a hereditary ruler of Romania. Some of those heriditary rights, though limited to property and nominal titular ones, were reinstituted by the post-Communist government. Note: Quoted material is from H. R. Seton-Watson‘s “History of the Roumanians,” Cambridge University Press, 1934. Very useful on this subject is the 2005 book by Ion Bulei, “A Short History of Romania,” Meronia Pub lishers Ltd, Bucharest, Romania. Also useful as a reference is Charles Upson Clark‘s well documented and readable “United Roumania,” Dodd, Mead and Company, NY, 1932. See evolution of provincial and national coat of arms. 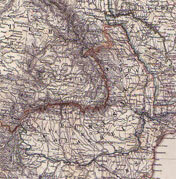 Bottom: German Atlas (1869) and British Atlas (1870s) to show the name overlayed on Moldavia and Walachia. In Greek, shows all provinces on one map as Rumunia from Tisa River to Nistru River. 1850 – P. Miller and Partners: “Harta generala a Moldovei cu invecinatele teri: Romania, Transilvania, Bucovina si Basarabia…” (Romania used for Wallachia region); printed in Iasi (Moldavia). Atlas shows the country divided into 32 districts. A map showing a large area with the name ‘Roumania‘ showing over Wallachia and Moldavia.